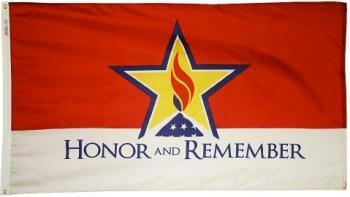 The Honor and Remember flag is nylon with standard header & grommet finishing. Made in the USA. All Star Flags is proud to carry the Honor and Remember Flag. The Honor and Remember Flag is a memorial flag that was developed to create, establish and promote a nationally recognized flag that would fly continuously as a visible reminder to all Americans of the lives lost in defense of our national freedoms. When you buy this fallen soldier flag, a portion of the proceeds is given to the Honor & Remember Organization.